For the Calgary Stampeders, Saturday night’s home-opener against the Winnipeg Blue Bombers is about finding their identity. A Canada Day double-header in the CFL finishes at McMahon Stadium on Saturday, where two Western rivals are coming off losses and looking to get back in the win column. The Bombers are hoping things are different this year while the Stamps look to continue their dominance in the wake of a 14-4 season – yet in last weekend’s 20-18 loss to the BC Lions, the Stampeders didn’t look like the Stampeders. “Come out and create an identity. 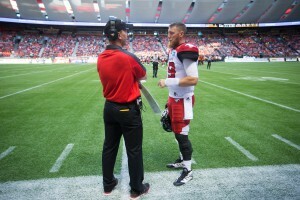 Find out what it’s gonna be,” Bo Levi Mitchell told Stampeders.com. The Stampeders haven’t started a season 0-2 since 2009, while the last time they lost two regular season games in a row was the first three weeks of 2012. Mitchell, 28-7 in his career as a starter including 5-1 against Winnipeg, has never lost two in a row. Yet despite leading 17-6 with one play left in the third quarter, Mitchell and the Stamps failed to do against the Lions in B.C. what they’ve done so well the last decade or so: close out games. The Stampeders had chances to put the game away in the first half and didn’t, and in the end a 73-yard punt return touchdown by Lions return ace Chris Rainey ended up being the difference. The Stamps scored just twice in five red zone opportunities, turning the ball over twice and also missing a key fourth-quarter field goal. 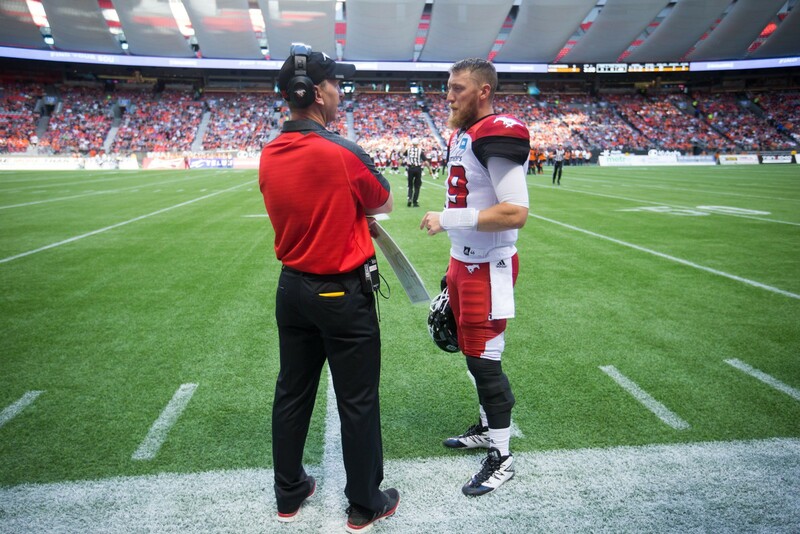 “When you have opportunities early, take advantage of them,” said rookie head coach Dave Dickenson, who dropped to 0-1 in his coaching career. “You’ve got to extend that lead. Second-year receiver Lemar Durant will not play for the Stampeders after appearing to suffer an injury on a highlight-reel grab in the second half as he fell to his back. Meanwhile, the secondary will get some reinforcements as safety Josh Bell, the quarterback of DeVone Claybrooks’ defence, is back in his usual spot. Cam Thorn will start at centre in place of rookie Roman Grozman as the Stamps wait for Pierre Lavertu to return from injury, but in the end it’s hard to pinpoint what exactly the Stamps need to do better. Their defence held Jonathon Jennings pretty well in check with 248 yards on 42 passing attempts and an average of 10.3 yards per completion. Special teams allowed the game-changing touchdown in the fourth but also blocked three punts in the first half. Some wondered why Jerome Messam had only seven carries (he rushed for 16 and a touchdown), while instead of Eric Rogers and Jeff Fuller catching all the passes like in the past, this time it was Durant and Kamar Jorden carrying the offence. “We know the reason we haven’t dropped two in a row for a long time is we remind ourselves early on in the week to really lock in,” said Mitchell. “We always come back with a different kind of attitude after we’ve lost a game.”Against a new-look Bombers team with some added flare to its lineup, for the Stampeders Saturday night is about finishing. Above all, they need to do the things they’ve done in the past to avoid losing two in a row. Both the Bombers and the Stamps have a different feel about them this year following an off-season of change, but the Blue and Gold can expect more of the same from the Stampeders coming off a loss. They know things didn’t go right in game one and they know it’s only the beginning of a long season. Yet this week there’s the feel of some urgency for the Bombers, a team focused on changing the culture in 2016. Whether it was Drew Willy or Andrew Harris, no one wearing royal blue is afraid to take responsibility for what happened in a 22-14 loss to the Alouettes in Week 1. “I put it all on me and I hope Drew puts it all on him,” said Offensive Coordinator Paul LaPolice in an interview with BlueBombers.com. “And I hope Darvin Adams puts it all on him. The Bombers got behind the eight ball early while an hour-long delay due to lightning in the area sucked some of the wind out of the team and the opening-day crowd. But in the end it was the inability to sustain drives early that allowed Kevin Glenn and the Alouettes to play keep-away, holding Winnipeg to a league-low 26:41 of possession including just 10:23 in the first half. Losing Weston Dressler to injury in the first quarter didn’t help, but by the time the Bombers showed some life with a highlight-reel Darvin Adams touchdown in the fourth quarter it was too little too late. They’ll be without Dressler again this week, who has been on the field for the last couple of days and appears close but could not be cleared for action. Thomas Mayo, who had stints with the NFL’s Oakland Raiders and New York Jets and bounced around the indoor game, will start in Dressler’s place. The 6-foot-2, 204-pound Mayo brings size and athleticism to the Bombers’ receiving corps, something LaPolice and O’Shea were looking for to complement their smaller and speedy receivers from the outset of camp. “Besides the frosted tips (in his hair)?” said LaPolice with a chuckle. “He’s such a good kid and he gets better every week. He’s fast for a big guy. He’s not afraid to go hit somebody. Darvin Adams moves into Dressler’s old spot while Mayo bumps inside, but the Mayo-for-Dressler switch is just another change to an offensive unit trying to build some chemistry with new receivers in Ryan Smith and Jace Davis, a new left guard in Jermarcus Hardrick along with a new tailback in Harris. Dressler took just eight snaps before his exit against Montreal (catching three passes), causing a ripple effect through the receiving corps. The silver lining this week is that Mayo has been in the attack since the first day of practice. Harris got stronger as the game progressed in his long-awaited Bomber debut, finishing with 13 carries for 80 yards (6.2 per carry) with another 40 through the air. Adams had a game-high 105 yards on five catches including his 63-yard touchdown. The defence was solid considering the amount of time it spent on the field, so on Saturday for the Bombers it’s about picking up a few missing pieces. Ask anyone in the Hamilton area what they have planned for Canada Day and you’ll probably get the same answer – going to the Tiger-Cats’ home opener. Tim Hortons Field is typically a nightmare for the opposition. The stadium is always packed with loud, proud fans showing their support for their favourite tabbies. Despite having one of the louder stadiums in the league, Hamilton’s head coach Kent Austin doesn’t think that it’s only the fan support gives a team home field advantage. The Ticats hope to carry the momentum from their impressive 42-20 victory over the Toronto Argonauts last week at BMO Field into Week 2 against the BC Lions in the first half of a CFL Friday night double header. The defence, led by Week 1’s Shaw CFL Top Performer Simoni Lawrence, wowed in the season opener in taking down Argos’ pivot Ricky Ray five times and Argos pivots six times in total. Lawrence collected seven tackles – including two of the six sacks – a fumble recovery, an interception and a touchdown. 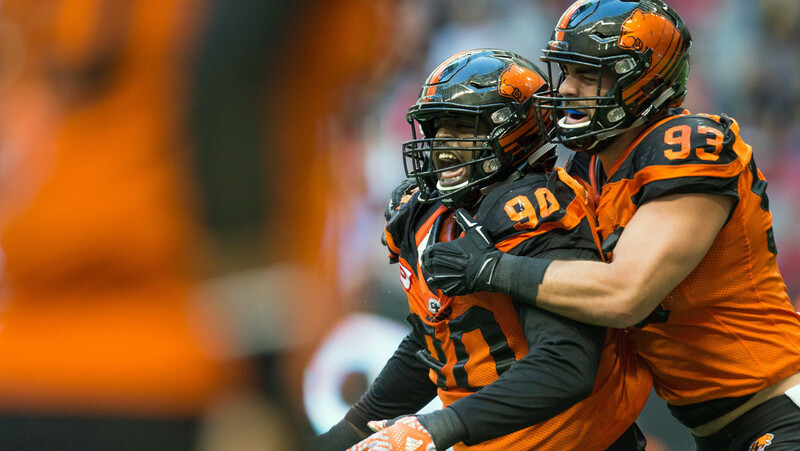 Lawrence and the rest of his defenders will tackle a BC Lions offence that just doesn’t quit. The Lions fought hard in Week 1 to come from behind to defeat Calgary 20-18 after trailing 17-6 heading into the final play of the third quarter. Bryan Burnham will also be looking to make an impact after he led the Lions receivers with 88 yards on five catches, one of eight different targets for quarterback Jonathan Jennings last week. Shawn Gore had seven receptions for 67 yards and Emmanuel Arceneaux grabbed four receptions for 39 yards. Jennings ending with 24 of 42 completions for 248 and no interceptions.One of the biggest challenges for Hamilton will be containing Lions running back Chris Rainey, who had quite the game against Calgary. Rainey scored the go-ahead touchdown on a 73-yard punt return in the fourth quarter to help ensure his team a 1-0 record. Scoring early and often will be on the forefront of the Lions’ game plan come Friday night, but most of all they’ll want to get off to a better start than they had in their home-opener against the Stampeders. Jennings and company were stymied by Calgary’s defence throughout a large chunk of the game, scoring only three points in the first half and 13 offensively all game. And while special teams won the game in the end for the Lions, they nearly coughed it up in the first half when Richie Leone had three of his punts blocked. In their first road test of the season, the Lions will have to avoid big negative plays like that but also put points on the board to keep the Ticats’ home crowd at bay. Wide receiver Tiquan Underwood returns to Hamilton’s lineup after being sidelined from an injury during the pre-season. Underwood, in his second season in the black and gold, will be another option for Hamilton quarterback Jeremiah Masoli to throw to when they hit the field. Masoli was striking in his season debut against the Argos, throwing for 318 yards on 27-of-37 passing. He also made 15 straight completions in the second half going 15-for-15 to four different receivers, Chad Owens, Luke Tasker, Andy Fantuz and Brandon Banks. “Right now Masoli is playing well,” Defensive Coordinator and Defensive Backs Coach Mark Washington told BCLions.com. “He’s controlling the offence, he has good mastery of the offence and they’re showing a lot. Friday night will also be the fans in the Hammer’s first look at Owens, who nabbed his first touchdown in the black and gold against his former team last week. As for the questions surrounding whether or not Brett Maher would be a good enough replacement for the CFL’s most accurate kicker Justin Medlock, who was signed by Winnipeg on the first day of free agency, Maher silenced them all in Week 1. In his Ticat debut, Maher went 4-for-4 on his field goal attempts including a 50-yard kick, the first 50-plus yard field goal of his CFL career. 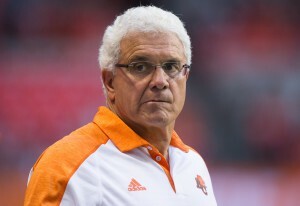 BC’s bench boss, and the CFL’s winningest active coach, Wally Buono is fully aware of the atmosphere of the enemy territory he and his lions will be prancing into and it doesn’t faze him one bit. Ricky Ray completed a pair of touchdown passes on his opening two drives which was enough to stave off the Saskatchewan Roughriders and lead the Toronto Argonauts to a 30-17 win in the final home opener at Mosaic Stadium. Friday night marked the official start of the Chris Jones era in Saskatchewan after a much-publicized off-season move from Edmonton to Regina just days following his leading the Eskimos to a Grey Cup victory. It too marked the return of Darian Durant who was seeing his first meaningful reps since the first quarter of the 2015 season where he suffered a season-ending injury. The Argonauts were coming off an opener that was electric while opening up BMO Field as their new turf but struggled against a well-prepared Hamilton Tiger-Cats club. The biggest challenge for Toronto in Week 1 was the slow start, something that was not an issue in the opening moments of this one. After getting a quick two-and-out on the Riders’ first possession, the Argos were set to get the ball with good field position but veteran returner Larry Taylor ensured that Ray had the ball inside the Saskatchewan 5-yard line after taking a punt 59-yards. Ray promptly found SB Andre Durie in the flat on the next play who stretched across the goal line for the Argos touchdown and a quick 7-0 lead. The Riders countered with a 48-yard gain but their drive stalled inside the Argos 30-yard line when they turned the ball over on a QB sneak that didn’t reach the first down marker. Ray wasted no time expanding the lead. The very next play, Ray stepped into a deep ball on a pump-and-go, spotting sophomore receiver Vidal Hazelton wide open for an easy 56-yard touchdown. A total of 98 yards on three passes and Ray had the Argonauts up by two scores early. As the second quarter began, Ray cooled a bit as the Riders took away the deep ball that burned them in the first frame and forced Ray underneath to checkdowns. A pair of consecutive stops on defence eventually netted the Riders some momentum. An 8-play, 76-yard drive, aided by 30 yards in Argos penalties, was capped off with a 7-yard touchdown pass from Durant to former Argo WR John Chiles who cut the lead to 14-7. However, as soon as momentum swung in Saskatchewan’s favour, the Argos literally scooped it back. Already with a turnover on downs the Riders looked to convert another third-and-short QB sneak but a fumbled snap between centre Dan Clark and backup QB Bryant Moniz resulted in a fumble and a 37-yard touchdown scamper by DB Matt Black. The 8-year veteran DB was forced into the every-down safety spot after Jermaine Gabriel left the game with an injury. Black’s third career touchdown put the Argos back up by 14 points and they took an 11-point lead to the locker room at halftime after the Riders closed the quarter with a 27-yard Tyler Crapigna field goal. As the second half opened, so too did the Riders offence. Durant put together a pair of first downs before connecting with WR Ricky Collins down the sideline for a big gain. The Texas A&M product’s 35-yard athletic snag set the Riders up inside the redzone but he Argos once again held tough and forced Crapigna to hit a 15-yarder. The Argos countered with a 28-yarder of their own on the ensuing drive to keep the lead at 11. After the Riders made good on a field goal and also sent one wide left, the defences battled back and forth, bending but not breaking as the Argos looked to kill the clock and the Riders tried to mount a comeback. Taylor all but sealed it for the Argonauts with 2:34 left in the contest when he fielded a punt in his own zone, cut across midfield and romped down the Saskatchewan 25 yard line. Two plays later Hajjrullau knocked through a field goal to close it out for the Boatmen. The Argos will stay on the road for Week 3 as they take on the Lions at BC Place while the Riders head to Edmonton where Chris Jones will face his old Eskimos squad. The star power of Trevor Harris continued to grow on Thursday night in Montreal. The Ottawa pivot was once again a difference-maker for the REDBLACKS, who edged the hometown Alouettes 28-13 to move to 2-0 on the young 2016 campaign. Harris consistently shredded the Montreal secondary, completing 20 of 26 passes for 395 yards and a trio of passing touchdowns. Thursday proved to be a tough night for kickers in Montreal, and the theme began early when Ottawa’s Chris Milo pulled his 35-yard attempt wide right just over five minutes into the ballgame. Als return man Stefan Logan took a knee, and the REDBLACKS took a 1-0 lead. The visitors nearly scored the game’s first major midway through the opening quarter, when Harris hit Brad Sinopoli over the middle for a lengthy pickup; Sinopoli seemed destined for pay dirt, but Chip Cox stripped him deep in Als territory. Montreal recovered, and the REDBLACKS were left to wonder what could have been. Montreal kicker Boris Bede then levelled things up with a 52-yard punt single late in the first quarter. Bede’s miss from 36 yards early in the second quarter — his first career miss from less than 40 yards — tacked on a single, and Montreal led 2-1. Ottawa surged back on its next possession, with running back Travon Van stringing together a series of slicing runs, highlighted by a 28-yard dash down the right side into the Montreal red zone. Trevor Harris then hit a wide-open Ernest Jackson steps from the end zone two plays later, and the REDBLACKS led 7-2 following a missed two-point convert. Montreal’s receiving core took a blow midway through the second quarter, when S.J. Green (leg) was forced out after falling awkwardly on a 50/50 ball against Jerrell Gavins. The injury bug continued to make its presence felt, as Ottawa special-teamer Olivier Goulet-Veilleux went down with a serious leg injury which placed the game in a lengthy delay. Another steady Ottawa drive late in the first half was wrapped with an exclamation mark by Harris, who rolled out to his right before threading a needle to receiver Greg Ellingson in the end zone. With the PAT, Ottawa led 14-2. Bede was able to redeem himself somewhat on the final play of the first half, a field goal he drilled from 53 yards to cut the Als deficit to nine at halftime. 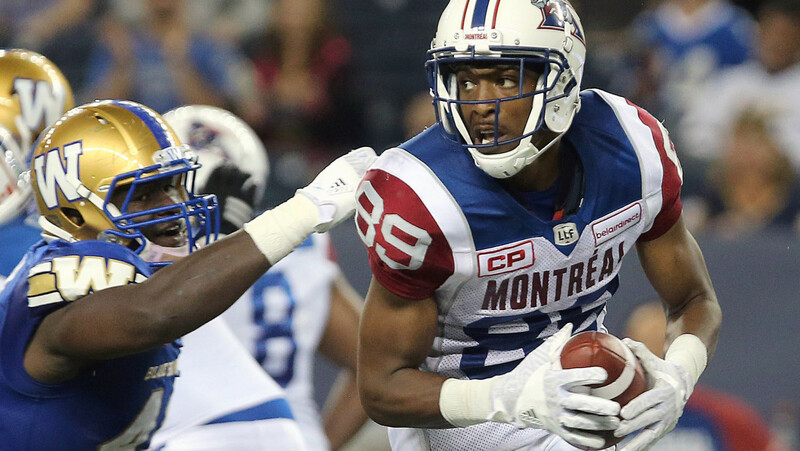 Montreal clawed its way back into the game at 7:41 of the third quarter; quarterback Kevin Glenn found receiver Duron Carter, who took a hard hit but hung on to the ball, in the end zone for the hosts’ first major. Carter’s consequent celebrations sent him barreling into Ottawa head coach Rick Campbell; after a dust-up and some gentlemanly group discussion, Carter and Ottawa defensive back Jerrell Gavins were both ejected. Bede added a single on the ensuing kickoff to cut the Ottawa lead to 14-13. Milo countered just two minutes later with a field goal of his own from 30 yards out to push the REDBLACKS lead to four. The Ottawa kicker split the uprights again, this time from 41 yards, four minutes into the final quarter to open the REDBLACKS lead up to 20-13. Harris put the game on ice for Ottawa at the 6:35 mark of the fourth quarter, when he hit Chris Williams deep in Als territory; Williams had torched Jovon Johnson, and would not be caught en route to the big house. Milo added the PAT and the visitors had their insurance cushion, up 27-13. A late-fourth quarter punt single from Milo polished off the scoring on the night and pushed the Ottawa lead to 15. The Als’ comeback efforts were hampered by the absence of receivers S.J. Green (injury) and Duron Carter (ejection); Montreal’s packages were limited and the REDBLACKS were able to key in on Nik Lewis. Injuries hurt Ottawa, too, as running back Travon Van was forced from the ballgame after a promising 86-yard, 12-carry start with a lower-body injury. Canadian Kienan Lafrance was decent in relief of Van. Week 3 will see the REDBLACKS return to the nation’s capital to host their home opener, another Thursday Night Football showdown on July 8th against Calgary, while Montreal will have an extra week to reflect on the defeat before a Week 4 matchup against Hamilton. As though the waiting game wasn’t already hard enough, it only gets tougher for Darian Durant and the Saskatchewan Roughriders. The Riders say hello to a new season on Thursday night in Riderville, while at the same time begin saying goodbye to a long-time landmark in Mosaic Stadium. After a bye week to open the 2016 schedule, waiting until 8:00 p.m. local time to face the Toronto Argonauts might be difficult. “I’m kind of sad that it’s a night game,” Durant told Riderville.com. “Just waking up having to wait all day to come out and play. But at the same time night games are always exciting here so it’s just going to be an exciting day and I’m looking forward to it. 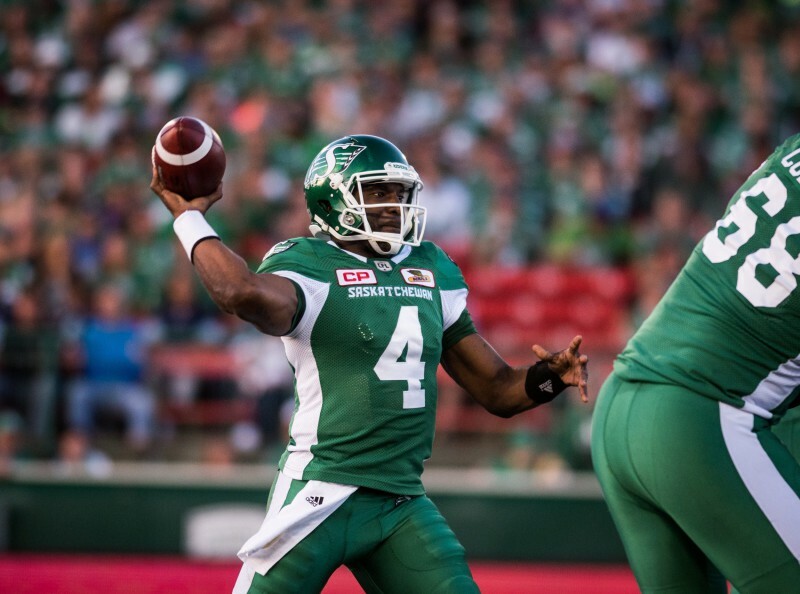 With equal anticipation wait the fans in Rider Nation, and the same goes for Chris Jones. No team has overhauled its roster more than the Riders this year and no team enters the season with more uncertainty. On Thursday night everyone will see some sort of semblance of what the 2016 Riders are all about. Jones was hired as the team’s football czar – the head coach, general manager and vice-president – after the team cleaned house following a three-win season in 2015. After Jones took the Eskimos from cellar-dwellers at 4-14 to Grey Cup Champions at 14-4 in a matter of two years, Riders fans are hoping he can work his similar magic in Saskatchewan. With a re-worked roster with the subtraction of big names like Weston Dressler and John Chick and the addition of the likes of Shawn Lemon, Justin Capicciotti and Kendial Lawrence among many, many others, there’s no doubt the Riders are already being built in Jones’s mold. Veteran quarterback Durant is one of a handful of returning players along with veteran Rob Bagg and young receiver Nic Demski – yet with so many new faces on both sides of the ball, some patience may be required. Durant is playing his first game in over a year after suffering a season-ending Achilles injury in last year’s opener, while approximately 35 players on the team’s 46-man roster will be making their Rider debuts. “It’s just another great opportunity to do something special this season,” said Bagg, the veteran receiver now in his ninth season with the team. “Every year it’s a fresh start and this year it’s no different – I love the pieces we have here.But with uncertainty and the unknown also comes possibility. So too is Jones, who will lean on a veteran offence and a young defence that he expects to be ‘very fast’ and ‘very athletic’. Facing an angry Argos team coming off a home-opening loss is a solid first challenge. “We’ve got to go out and we’ve got to play a solid football game against a very good football team in Toronto,” said Jones. “They’re very well-coached and they didn’t play very well last week, and we’re not the only ones that know that – they know it as well. The Argos definitely know they weren’t themselves in Week 1. They lost 42-20 to hated arch-rival Hamilton, but it’s not just the loss that stings – it’s the fact that it came in a game they’ll never be able to get back: the first ever game at BMO Field. The O-line couldn’t keep a clean pocket for quarterback Ricky Ray, who was sacked five times, threw an interception and fumbled once. Meanwhile, Brandon Whitaker and the Argo offence couldn’t establish anything on the ground, finishing with just one yard on seven attempts – their lowest rushing total since 2009 and the lowest by any CFL team in a game since 2011. With a new-look O-line led by off-season addition Josh Bourke and a young defence coached by another newcomer in Defensive Coordinator Rich Stubler, the Argos are still learning but expect to be much better after seeing it all on film. “We just weren’t ourselves,” said national defensive end Ricky Foley. “It was good to see on film; make our corrections. Head Coach Scott Milanovich was particularly frustrated with the Argos’ inability to capitalize on momentum during their Week 1 loss. A slow start had them down 25-6 at one point, but two touchdowns by Vidal Hazelton within a minute made it a five-point game. It was as though all the Ticats had to do was press down on the gas again though. 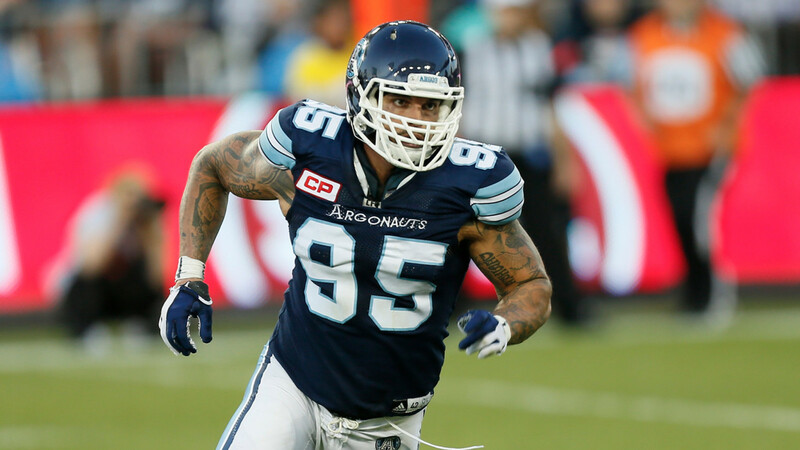 Jeremiah Masoli completed 15 straight passes against the Argo defence while former Argonaut Chad Owens put the game away, and in the end the five-point third-quarter deficit was the closest the Argos could get. On Sunday they face a stiff test against a new-look Rider team that’ll be excited to play at home, but the hostile territory coming off a loss is welcomed by the Argos’ fifth-year head coach. “Our players love to play there. I love to play there. It’s fun,” said Milanovich. “It’s a college-type atmosphere from my perspective. Their fans are always fired up. It’s the way football should be played. Ray will look to get the Argo offence humming again, one that’s used to finishing in the top half of the league under the offensive-minded Milanovich but last season fell to sixth overall. 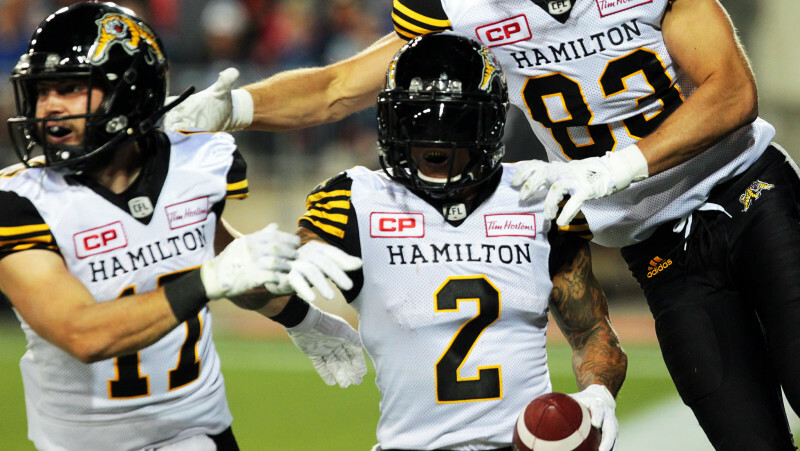 The veteran pivot threw for 282 yards, a pair of touchdowns and an interception on 26-of-36 passing in the face of a constant Ticats pass rush. The Argos, meanwhile, will have to wait until mid-July to get another crack at it in front of their home fans, but for now they have a chance to do some early-season bonding. After playing in Regina on Thursday night, Milanovich has them heading straight to B.C. as part of a nine-day road trip. Linebacker Marshall McFadden and receiver Kevin Elliott will not play for the Argos after each being added to the six-game injured list, opening the door for Thomas Miles to start at middle linebacker for the Boatmen and Kenny Shaw and Wallace Miles to get more touches in the receiving corps. The Riders, meanwhile, enter their season-opener relatively unscathed but will have a pair of newcomers in the secondary in veterans and former Stampeders Buddy Jackson and Brandon McDonald, both slated to start at halfback. Thursday’s game will also be a big matchup for Greg Jones, the former Argos linebacker who will play his first game as a Rider against his former team. If the Montreal Alouette fans who head to Percival-Molson Memorial Stadium on Thursday night are anything like they’ve proven to be in the past, the Ottawa REDBLACKS’ offence is in for a loud night. The East Division match up will be the Montreal faithful’s first peek at the Alouettes of the 2016 season, including the new-look offence led by Offensive Coordinator Anthony Calvillo. “It’s going to be great to get back out in front of our home crowd,” said veteran quarterback Kevin Glenn. “We had the one pre-season game (this year) but this time it’s a regular season game. So far so good for the Alouettes’ offence, which will look to build on a strong start in Winnipeg. The Alouettes have a great chance at becoming that winning team in their first of three match-ups against Ottawa if they continue to buy into Calvillo’s game plan the same way they did in their 22-14 win over Winnipeg in Week 1. “You can see now it’s Anthony Calvillo’s offence,” REDBLACKS defensive end Arnaud Gascon-Nadon told OttawaREDBLACKS.com. “He’s running it the way they ran it when he was quarterback so you’re going to see a lot of the running game, quick passes, protect the quarterback and trying to get the ball in the hands of the play makers. Leading Montreal’s charge is 37-year-old Glenn, who completed 30-of-42 pass attempts for 332 yards and a touchdown in the season opener. That unit was in command most of the night, although two turnovers inside the red zone left points off the board. Glenn will have plenty of options to throw to on the first half of Thursday’s double header, having found eight different receivers last week including Duron Carter, who had seven receptions for 69 yards in his first game as an Alouette after returning this off-season, and Nik Lewis, who collected 51 yards on six catches. Lewis, Carter, Stafford and S.J. Green form one of the CFL’s most formidable pass-catching units and could make the Alouettes a much-improved offensive team throughout 2016. Burris has reportedly been placed on the six-game injured list, meaning, for now, the REDBLACKS are Harris’s team.Trevor Harris will make his first start behind centre as a REDBLACK when Ottawa takes the field filling in for starting quarterback Henry Burris, who suffered a pinky injury on his throwing hand in the REDBLACKS’ thrilling 45-37 overtime victory against Edmonton in Week 1. 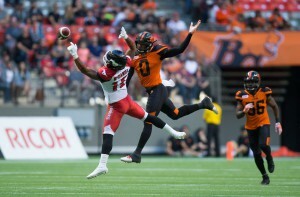 Harris wasted little time after taking the field to justify the REDBLACKS’ decision to sign him this off-season – one possession to be exact – throwing a long bomb to Chris Williams for a 71-yard touchdown on his first passing attempt. The former Argonaut pivot impressed in the rest of his debut as well, connecting on 17 of 19 passes for 292 yards and three touchdowns. Montreal’s red hot defence – a defence that allowed a league-low 14 points and only one touchdown drive last week – will be another story for Harris to deal with. Defensive end John Bowman will be the biggest pest, having already collected seven tackles and two sacks in the first game of the regular season. While Ottawa put up gaudy numbers against the Eskimos’ depleted secondary, points won’t come as easy against Montreal. That also means the REDBLACKS’ defence will have to be stingier than it was against Mike Reilly and the Eskimos. The REDBLACKS ended the 2015 season series victorious, finishing a perfect 3-0 against Montreal in their stellar second season as a franchise. Montreal took all three the season before. Based on history alone, it’s anyone’s guess who will come out on top this week. Chris Rainey scored two touchdowns and made a clutch second-down catch late in the game, helping the Lions grind out a 20-18 home-opening win against the Calgary Stampeders. Rainey scored the go-ahead touchdown on a 73-yard punt return with 13:35 left in the fourth quarter while Rene Paredes missed two field goals and a convert for the Stampeders, helping the Lions come from behind to surprise the Stampeders and kick off their season with a 1-0 record. The return by Rainey was a fitting turning point in a game dominated by defence and special teams, as both Jonathon Jennings and Bo Levi Mitchell looked ordinary while the other facets made all of the game’s biggest plays. The Stampeders blocked three punts but failed to take advantages of some golden opportunities, including a first and goal at the one that resulted in a turnover on downs after four straight plays of failing to find the end zone, along with an early fumble by Mitchell. While the Stamps held a two-score lead at one point in the third, it was Rainey’s one-yard touchdown run that pulled the Lions close and then, after a quick stop by the Lions’ defence, a spectacular return by one of the game’s most electrifying return men that made the difference. In his first opening-day start, Jennings threw for 248 yards and no touchdowns or interceptions on 24-of-42 passing. Bryan Burnham had a game-high 88 yards on five catches as he looks to emerge as a top threat for the Lions in his third season in the league. Mitchell threw for 233 yards and a touchdown with no interceptions in the loss for the Stampeders. His favourite receiver was Kamar Jorden, who finished with 73 yards on three catches including the game’s only receiving touchdown. With all the questions about who Mitchell might throw to in 2016, the 27-year-old Jorden answered the bell early for the Stamps’ offence when he hooked up with his quarterback for a 48-yard pickup on the game’s opening drive. Looking to get on the board early and take the Lions’ home-opening crowd out of the game, Mitchell was sacked on a second-and-seven play by T.J. Lee on the blitz and lost a hold of the football. Big interior Mic’hael Brooks came up with the loose ball, immediately ending the threat and giving the Lions’ some early momentum. More than anything, however, the impressive defensive play set the tone for how the rest of the game would unfold. While all eyes were on the young pivots Mitchell and Jennings, neither could find the spark early on as defensive coordinators and former CFL players Mark Washington and DeVone Claybooks had their defences dialed in. The Stamps got the football back and Mitchell put them back in scoring range, but Paredes missed his first field goal try from 47 yards out and Calgary opened the game with a single to make it 1-0. Paredes wouldn’t make the same mistake on his next try, making good on a 43-yard field goal try to make it 4-0 Calgary, while Jennings and the Lions’ offence continued to struggle with back-to-back two-and-outs. Third-year Stamps starter Mitchell continued to move the ball for the Stampeders but the offence couldn’t find ways to capitalize early on. With nine minutes to go in the half and a four-point lead, Calgary was stuffed on four straight plays at the BC goal line, including an off-side accepted against the Lions, leaving another Stamps possession without anything to show for. It wasn’t long later the Stampeders finally cracked the code and finished a drive. Mitchell completed his first three passes of the drive, including a 25-yard pickup to Lemar Durant, setting up an 18-yard touchdown to Jorden to give Calgary a 10-0 lead after Paredes missed the extra point. The Lions responded with a late field goal from Richie Leone, but in the end the first half was defined by three blocked punts on special teams for the Stampeders and a Calgary offence that couldn’t cash in on its chances. 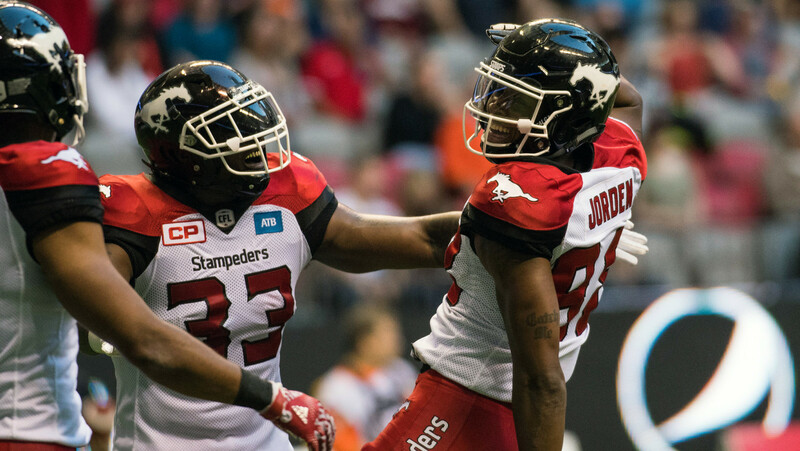 Jennings got in a rhythm in the third and set up a Leone field goal midway through the quarter to shrink the Lions’ deficit to four, but the Stampeders didn’t take long to respond. While the Lions struggled in the run game in the first game after the Andrew Harris era, the Stampeders couldn’t muster much on the ground either despite having the big Jerome Messam in the lineup to replace the retired Jon Cornish. Yet when a 59-yard kickoff return by Roy Finch and a 31-yard completion to Durant put Calgary in prime scoring position, it was the 6-foot-3, 245-pound Brampton, Ont. native in Messam who finished off the drive with the two-yard touchdown. Messam’s first touchdown of the season extended Calgary’s lead to 17-6, and the Lions needed an answer from their 24-year-old sophomore quarterback in a hurry. You could get the sense that Jennings was getting into more of a rhythm against a young Stampeder defence as the game progressed, and he only heated up heading towards the end of the third quarter. Jennings hit Burnham for a 15-yard pickup to get sticks moving, then after a 10-yard completion to Shawn Gore drew a pass interference penalty on the Stamps’ defence. Two more completions to Burnham and the newcomer Nick Moore put the ball at the one, and from there it was the former University of Florida running back Rainey finishing the drive off with the one-yard touchdown run. Arceneaux couldn’t haul in the pass on the two-point conversion, but the Lions cut the Stampeder lead to 17-12 at the end of the third. A quick stop by the BC defence and it wasn’t long after that the Lions turned the tables completely. On the very next punt, Rainey found an opening down the sideline, sprinting for a 72-yard punt return touchdown, his second major of the game. Moore scored on the two-point conversion, giving BC a 20-17 lead early in the fourth quarter — the Lions’ first lead of the game. As Mitchell looked to mount a response on the following drive, the Lions’ defence stepped up again, this time sacking Mitchell for the second time of the night on second down to stop the Calgary offence in its tracks. Alex Bazzie’s sack of Mitchell and a punt out of bounds by Rob Maver gave the Lions solid field position just half a quarter away from starting their season with a win. Yet you just knew the Stampeders weren’t going to give up. Their defence made a quick stop to get the ball back in the hands of Mitchell, who promptly completed four straight passes, including one to offensive lineman turned eligible receiver Dan Federkeil for 21 yards. But immediately after Adam Bighill ended the drive with a sack, the Stampeders looked to tie the game on a 31-yard field goal by Paredes with just over three minutes remaining. After struggling with two early misses, including an extra point, the veteran kicker again fired wide. Thanks to some effective running by Jennings and a highlight-reel grab by Rainey at the sticks in addition to a first down run by Jeremiah Johnson, that was the last chance the Stampeders would get. 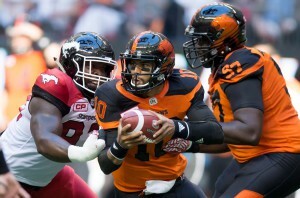 Johnson finished with 44 yards on nine carries to pace the Lions’ rushing attack while Messam, replacing the retired Jon Cornish, was held to 16 yards and a touchdown on seven carries against a stingy BC run defence. Moore was an active part of the Lions’ passing attack in his first game back in B.C. after signing with the Lions, while Emmanuel Arceneaux was held to just 39 yards on four carries. The win for the Lions ended a run of four straight wins for the Stampeders, including this year’s pre-season game and last year’s Western Semi-Final. It also puts them all alone at the top of the West Division following Week 1, as the Stamps, Eskimos and Bombers are 0-1 while the Riders were idle. They’ll look to keep the momentum rolling with a visit to Tim Hortons Field to face the Ticats on Canada Day. After allowing only three points in the first half and leading through most of the first three quarters, the Stampeders let one slip away Saturday night and will try to get back on the board in their home-opener, also on Canada Day vs. the Winnipeg Blue Bombers.